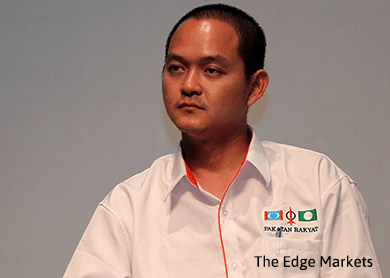 (Aug 18): DAP will be on the national consultative committee on political funding, the opposition party's strategist Dr Ong Kian Ming said, as Putrajaya moves to address the lack of rules governing party funds in Malaysia amid a scandal implicating the prime minister. The Serdang federal lawmaker confirmed that DAP was willing to be on the panel and expressed hope that the committee will focus on disclosure of political financing sources as well as declaration of assets by politicians. "I've gotten the commitment from the minister just now that DAP will be invited, so we will be happy to participate with the hope that it is something that's comprehensive," he said, referring to minister in charge of governance and integrity, Datuk Paul Low, at a seminar on Open Government Partnership in Kuala Lumpur today. Prime Minister Datuk Seri Najib Razak announced the committee last Friday, to be headed by Low, which will develop a plan to ensure transparency and governance over party funds to ensure healthy politics. The committee will draft an action plan to cover political funding, institutional change, monitoring, new regulations as well as law enforcement, and hopes to have it implemented before the 14th general election, scheduled for 2018. Najib had first mooted the proposal in 2009 as part of the Government's Transformation Programme (GTP) but said he had not received any response. Ong today said the committee needed to look at issues related to political spending, especially in terms of equality. The opposition has long complained of discrimination in the disbursal of federal funds for opposition-held constituencies and the use of government machinery during election campaigns. A few days ago, Najib had pledged to allocate more funds for BN MPs next year, up from the existing RM5 million. "I think this needs to be addressed because I think this is unfair, so the political financing consultative committee needs to address this as well," said Ong. Discrimination in the disbursal of federal funds for constituency development was also mentioned as a problem by other opposition lawmakers at a forum last night, where they said political funding reforms will not be effective as the ruling Barisan Nasional had always disrespected basic democratic principles. Putrajaya's move to introduce the committee has not been received well from both sides of the political divide as well the legal fraternity.